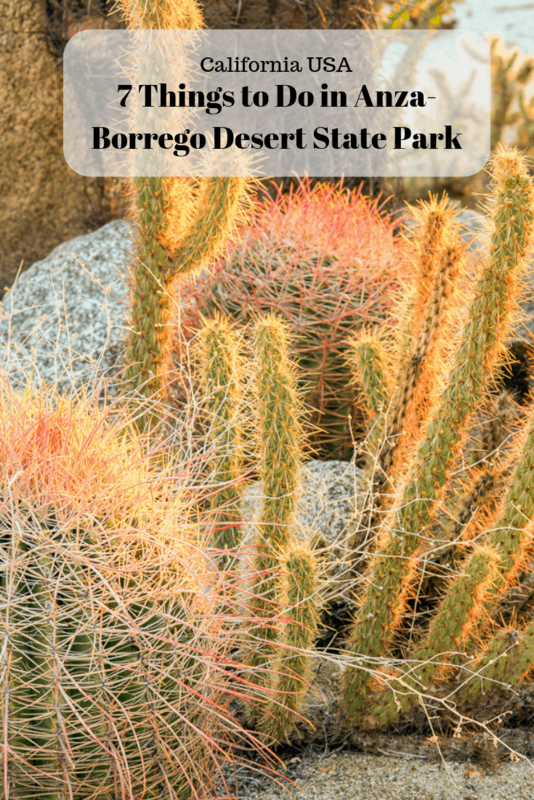 Borrego Springs is a tiny little town of a little over 3500 desert-dwelling people in the middle of the Anza-Borrego Desert State Park. It’s 2 hours from San Diego and 90 minutes from Palm Springs. 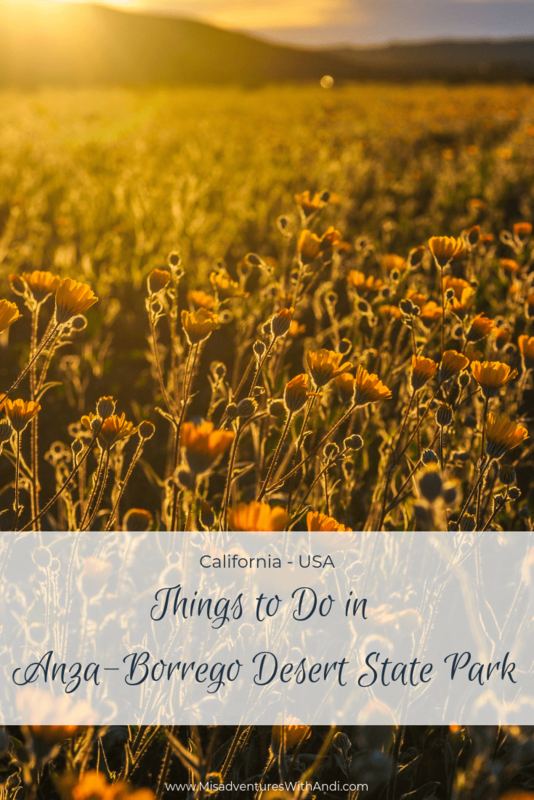 The inhabitants call their little slice of paradise California’s secret desert and after spending 3 weeks there, I would have to say that I totally agree! 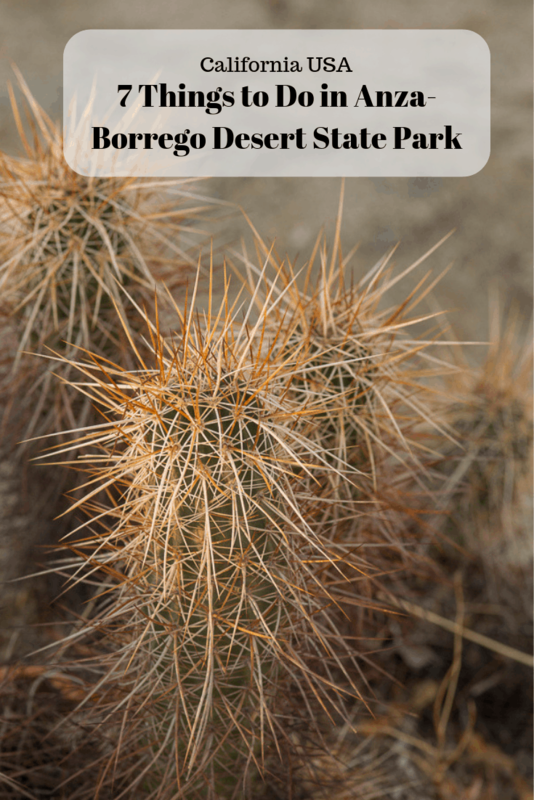 It was a total fluke that we found the Anza-Borrego Desert State Park. We were Googling “RV parks in San Diego” and The Springs at Borrego RV Resort, where we ended up staying, came up. Which led us to Anza-Borrego. 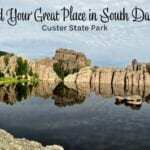 Given that it is the largest park in the continuous 48 states (there must be something bigger in Alaska…) I find it odd that so many people (I checked) have never heard of it. During our 3 weeks time there, we thoroughly enjoyed ourselves. The park has a lot to offer and we were never bored! I am sharing the seven things that I thought were the most fun, but this list is definitely not exhaustive and you may find other things you like better. Before diving into that list I have a couple of recommendations. 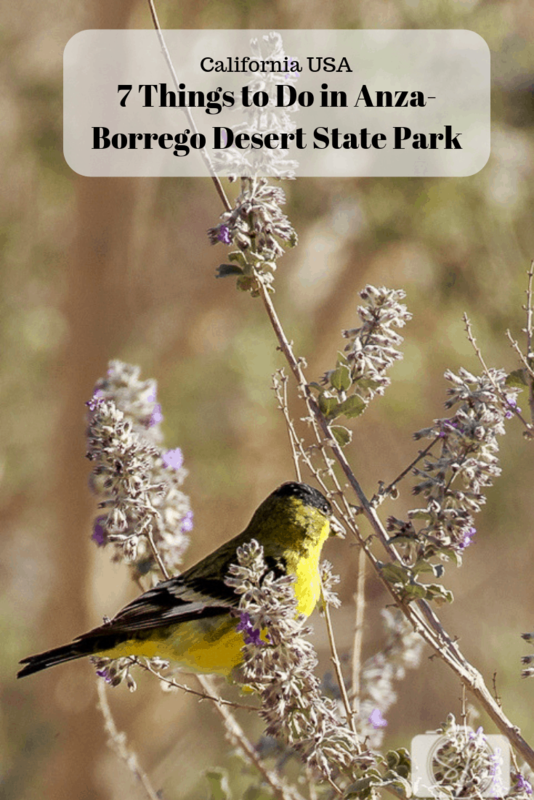 To start your visit to the park, drive to the town of Borrego Springs. Then through it and head straight to the Anza-Borrego Desert State Park visitor’ s center and buy their map for $2. It will be the best $2 you spend during your entire trip. The map is well done and will get you to most places. If you are going to be going into the washes or doing any offroad activities, I highly recommend that you also buy the Tom Harrison’s Recreation Map of the San Diego Backcountry which is really detailed topo map of the area, it is waterproof and plasticized for easy folding, this map was invaluable. If you don’t buy it ahead of time you can buy it at the Anza-Borrego Desert Natural History Association office located at 652 Palm Canyon Drive. 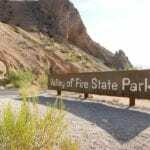 Not too far from the visitor’s center in the park’s official camping area is the trailhead for the Palm Canyon hiking trail. It is maintained (very well in fact) by the park so there is a day fee associated with hiking there. 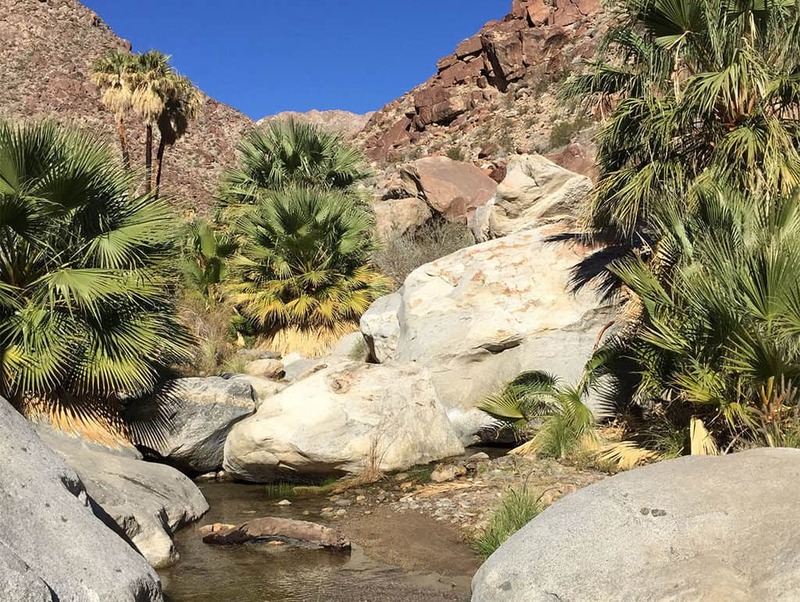 The trail is a moderate 3-mile hike and at the end of the trail, you are rewarded with a beautiful oasis of palm trees and cold water. One word of caution, if you or a family member are allergic to bees, I would discourage you from this hike. There are lots of bees buzzing and pollinating the trees on the trail, they didn’t bother us in the slightest, but depending on the degree of the allergy, you might be tempting fate! This is also THE spot to see the bighorn sheep. We didn’t see any, but most people we spoke with in the area and on the trail had seen them here. This was the only activity during our stay that we had to pay a fee to do. We’ve done all the work for you on this one. We went to every possible spot to either scout or take sunset photos – all the washes, all the points, all the peaks and Font’s Point offers the best sunset. The good news that it is also the easiest to get to. There is a sign off the S-22 (Borrego Salton Sea Way) and the wash is pretty straight-forward in terms of the 4-mile drive, although you do need a 4×4 vehicle. On the weekend there will be others, usually, a group or two enjoying a glass of wine as the sun goes down. During the week you are likely to have the point all to yourselves. 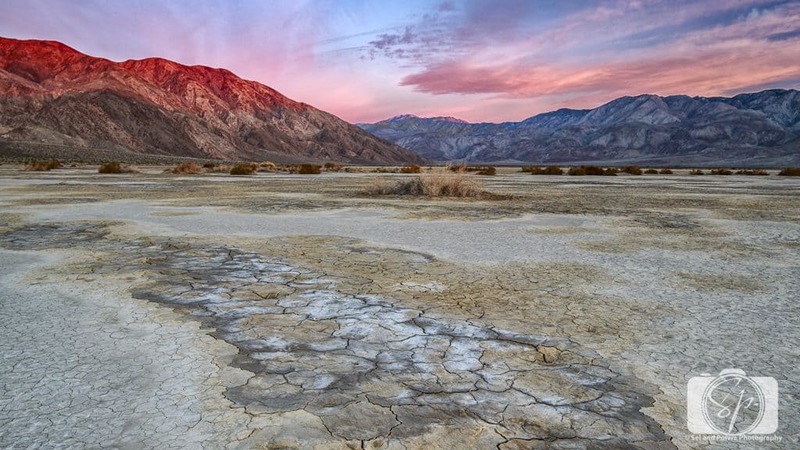 You can see more Font’s Point sunset photos in Mr. Misadventure’s Borrego-Springs portfolio on his website. 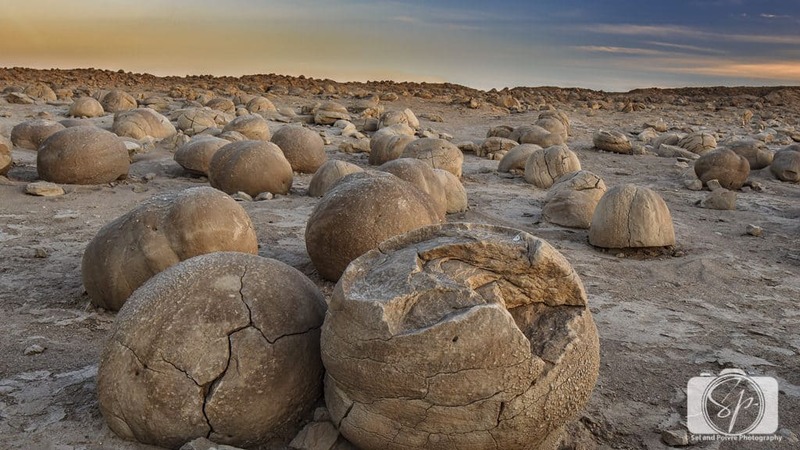 After being thwarted multiple times trying to access Bowling Ball Beach near Mendocino California in order to photograph the sandstone concretions there, Mr. Misadventures was super excited to learn that Anza-Borrego had their own version of rocks in an area known as Pumpkin Patch. 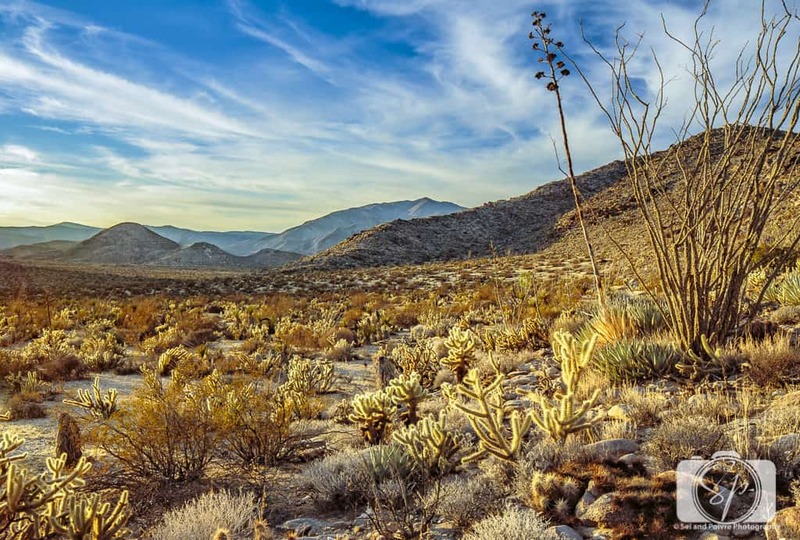 It is on the Anza-Borrego/Ocotillo Wells border and is protected by a fence. Fortunately, you can access the area by foot once you get through the badlands. It is not the easiest spot to find (you need that Tom Harrison map) but it is worth it if you are into that sort of thing. I think most of the motocross and ATV folks enjoying themselves in the awesome Ocotillo Wells State Vehicular Recreation Area (a park just for off-roading!) probably don’t care all too much about it, but these rocks are pretty cool to see. The badlands are well, badass. Whether you are looking at them from above, like in this photo from Vista del Malpais, or driving through them to get to one point or another, you feel like an astronaut looking out on a strange planet. Many times while driving through the rutted washes of the badlands I felt like I was on an amusement park ride where I am about to drive into a massive rock and just before you hit it, you make a sharp right. Certain parts of the badlands are not for the faint of heart, but they sure are super exciting! 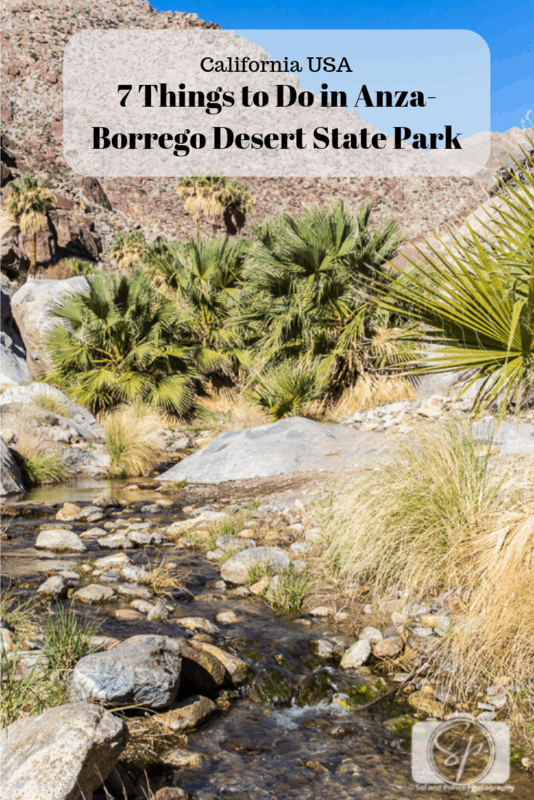 If you don’t feel your 4×4 skills are up to the task, there are businesses in Borrego Springs that do tours and they will do all the driving for you. We were disappointed in not being able to see bighorn sheep, but we did see coyotes, large hares, and bobcats. 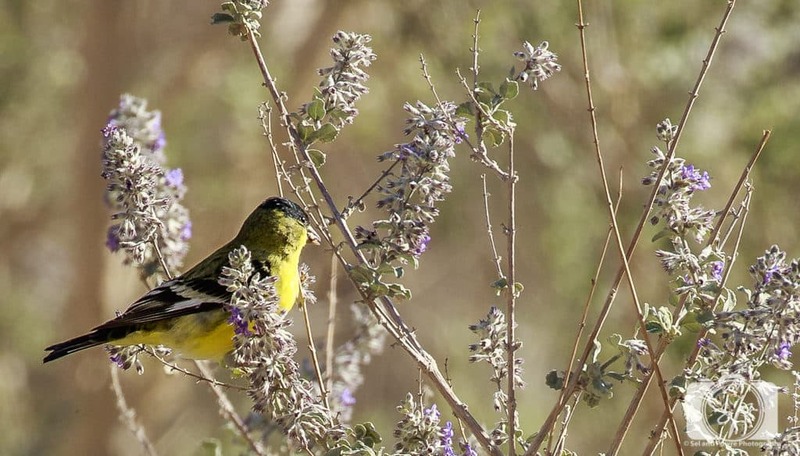 There are beautiful birds everywhere as well. We also heard the wildlife as well. An amazing owl lived or hung out in a tree near our RV and spoke to us every night. And the coyotes howled and played many nights, scaring the crap out of me. Their sound is definitely worse than there bite (unless you are a dog or cat and then well, you know…). When it comes to the animals you come for the bighorn and we hope to be able to come back and see them in the future. There are three hikes in Little Blair Valley: Morteros Trail, Marsha South Home, and Pictograph Trail. We hiked the last one, a very moderate 3-mile trail. One mile in is pictograph rocks which give the trail its name. But make sure you go to the end of the trail for a magnificent view of Sawtooth Mountains. These trails are very popular and easy to get to. We had a 4×4 but saw “regular” cars (even a Prius) on the route to the trails, so it is definitely accessible. We went back the next day to do sunset photos. Little Blair Valley, along with most of the park, in general, is a phenomenal place to watch the stars. I have a really cool app that Mr. Misadventures’ photography friends all use when doing evening shoots, but I love to use it so that I can understand what I am looking at. 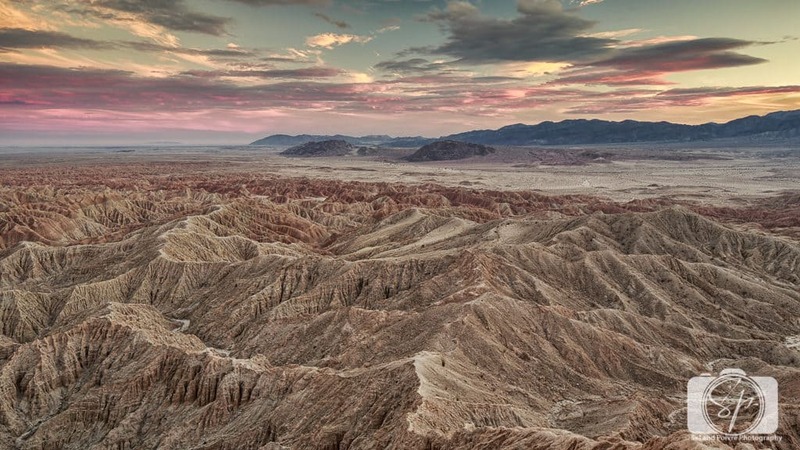 And when it comes to Anza-Borrego, what you can see is astonishing! 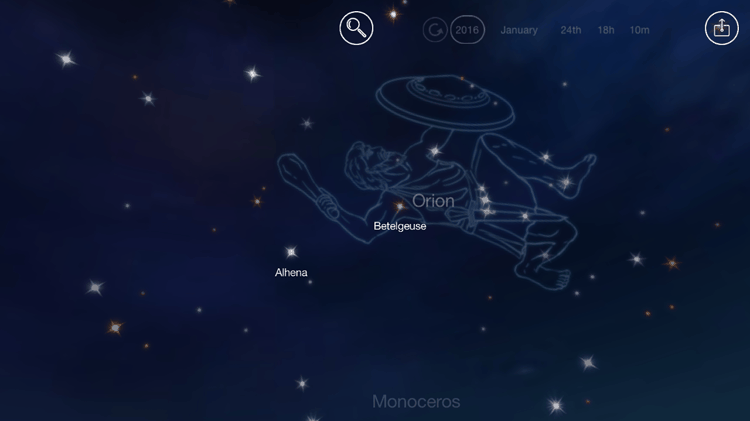 The app is called the Night Sky Pro, it costs $2.99 and you’ll want it while staying in Borrego. 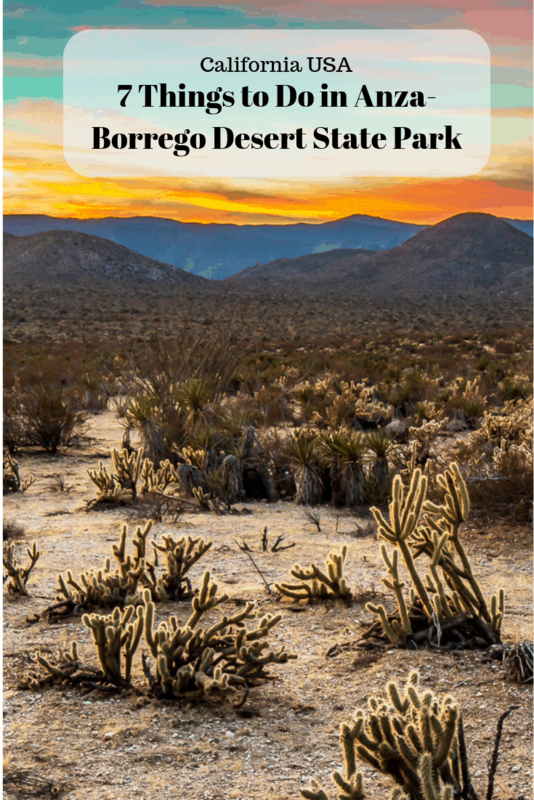 As you can see, there are lots of really great things to do in the Anza-Borrego Desert State Park! I still can’t believe that it was completely off my radar until now. I am so glad that it was our first stop Project Escape because it really did it feel like one. How about you? Were any of my seven things to do of interest to you? 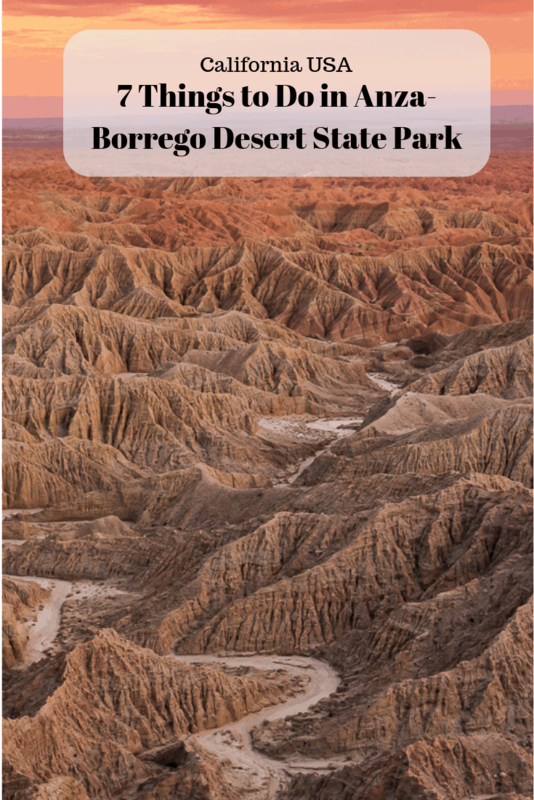 Have you been to Anza-Borrego Desert State Park and done these or other activities? Do you think you want to visit in the future? How have I spent so much time in the Southwest and never been to Font’s Point? It looks so cool! @Kristin, It’s kind of crazy that most people I talk to haven’t heard of this place either! I can’t believe we’ve never been there, especially since we don’t live that far away. Your pictures are gorgeous and I’m going to have to follow your whole itinerary now! @Lois, you are so close! You should definitely check it out. So cool. 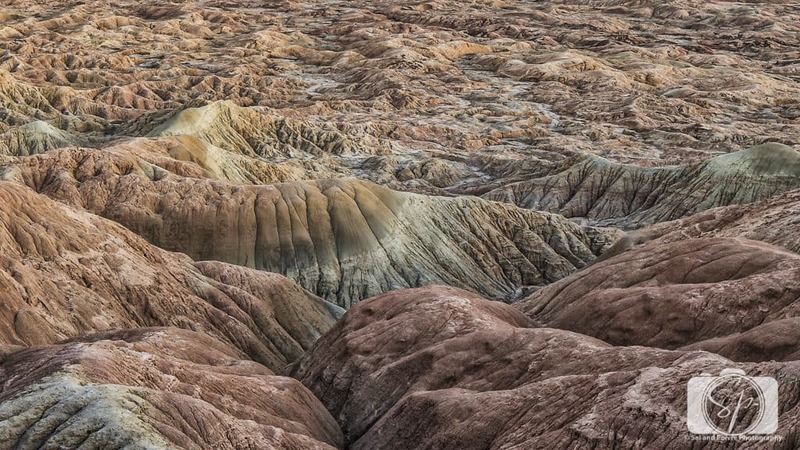 It looks otherworldly, as you mentioned about the Badlands. My fiancé and I are trying to find a good honeymoon spot and it occurred to me to do a road trip down to California. There are so many places like this that you miss out on when you opt for the convenience of air travel. @Murissa, a road trip would be a great idea, especially since you like California so much! Had to get up at 5:00 a.m. to do it, but I’m finally catching up on some blog reading. These are gorgeous shots!! @Katie, you know I totally appreciate the dedication and support! We are heading to Anza Borega SP next week and really appreciated reading your recommendations. As an amateur photographer, I especially loved seeing your shots. We won’t have access to a 4×4 while there, so a few of the destinations may not be accessible to us, but I’m counting on the cactus blooms making up for that. Thanks for sharing! Also, pack food in, the choices are limited. There are 2 grocery stores but the selection isn’t very large and the prices are high. There is a decent farmer’s market on Saturdays. Fill up on gas outside of Borrego, the gas prices are outrageous there – most expensive I saw all year! Great timing that I saw this, plan on visiting end of the month and hopefully there still might be some wildflower blooms. I want to the sunset vista so that looks amazing! I live here in salton sea.. there is so much more to see. There is a water fall that is running tgis time of year in Borrego. It’s a little hike but really nice. Like that pumpkin patch there are other places to see llii e the mud volcanos. Lots of off roading. Such a wonderful place to see and visit.